Belle maison avec 5 chambres, 3. 5 bains et beaucoup de commodités. Bienvenue à 'Sapelo' sur Saint- George Island, FL! Situé dans la magnifique communauté fermée de Plantation, qui offre des kilomètres de pistes cyclables et de sentiers pédestres, une faune abondante, une végétation luxuriante, un accès à la pêche sur Bob Sike's Cut et un magnifique pavillon où vous pourrez profiter de la grande piscine, des courts de tennis et du centre de remise en forme. Profitez assis sur votre véranda tout en regardant les magnifiques couchers de soleil sur la baie, ou faire une promenade sur une passerelle de 200 pieds de plage de sable privée. Ici vous pourrez découvrir à la fois la baie et le golfe, et vous êtes seulement un demi-mile de la coupe de Bob Sike. Il est une excellente pêche au crabe et à partir de votre propre quai privé. Le tout dans cette spacieuse maison personnalisée de constructeur de 3 000 pieds carrés rénovée avec planchers de bois franc et de carrelage. La maison comprend un grand salon et une cuisine confortables et ouverts, cinq grandes chambres, dont deux à l'étage principal avec deux lits doubles, deux chambres au deuxième étage avec deux lits jumeaux et une chambre mezzanine avec un lit queen-size. lit. COMMODITÉS: 4 téléviseurs, lecteurs DVD, CD / stéréo, Wifi. Deux suites principales, grande cuisine bien équipée avec comptoir en granit et électroménagers en acier inoxydable, bibliothèque de jeux / livres / DVD, baignoire à jets dans la salle de bain de l'étage supérieur, grande véranda et transats meublés, solarium, douche extérieure, barbecue au feu de bois, station de nettoyage du poisson, stationnement sous le béton dans la maison, quai privé de 225 pieds (bateaux à faible tirant d'eau recommandés). Si vous avez des questions, appelez la propriétaire, Denise Schmidt, à sept heures sept zéro, deux zéro sept, neuf sept un neuf. Une douche extérieure est également disponible sous la maison. This was the second year that we spent the month of February at Sapelo. 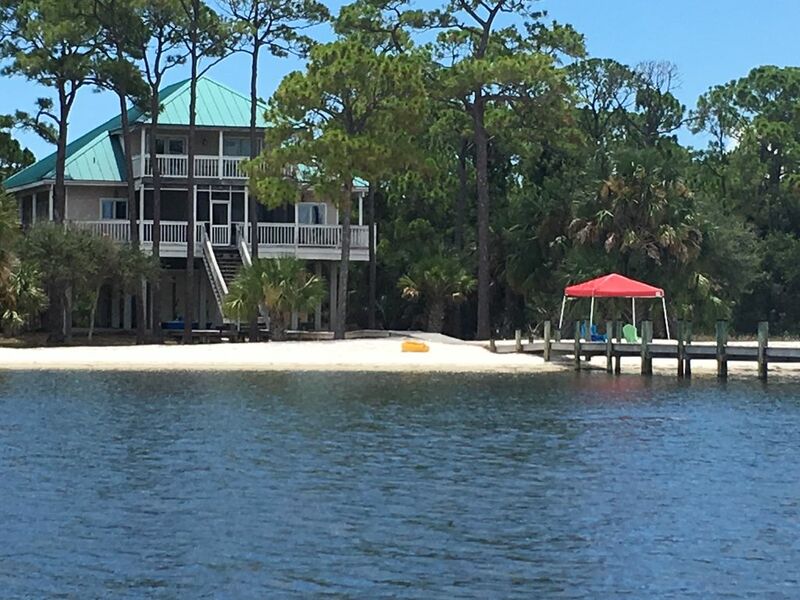 We really enjoy the home, its location, the white sand beach and dock. The sunsets are spectacular and as an amateur photographer I can't get enough sunset photos as they change every night. We also utilized the walking/biking paths every day and on rainy days we used the fitness center at the clubhouse. Nearby Apalachicola has wonderful restaurants and shopping. We took a boat tour on the Apalachicola River this year and would definitely recommend doing that. It's a unique experience. Looking forward to coming back next year! I'm glad to hear you had another wonderful get away. I would love to see more of your beautiful pictures! The river excursion is on my list to do someday. Looking forward to having you stay again next year! As a repeat renter it's always hard to come up with something new to say about how much we enjoyed our recent stay at Sapelo. If you want to know how we really feel probably all that needs to be said is that this is our 4th (or maybe 5th) visit in the last few years and we've already made plans for our next one. Thanks to hurricane Michael earlier in 2018 many homes in the St George island Plantation, particularly on the Gulf beach side, suffered some damage although fortunately it appeared to be fairly minor compared with the destruction communities further west suffered. Nevertheless, there was a lot of construction activity, mostly repairing breakaway storage areas under homes, on the Gulf front beach side. In contrast, Sapelo, being on the Bay side of the island, came through in good shape, it was very peaceful and quiet, and we felt fortunate that the owners were able to allow us to keep our reservation. The room layout at Sapelo works perfectly for us. The two master suites and separate top floor living area and bedrooms provide excellent privacy for us as well as couples and family members who visited during our stay. As with our past times at Sapelo the house was clean and ready when we arrived and everything was in good working order, save for one TV in the top floor bedroom which was promptly fixed by the owner. The nice private beach, the dock, and beautiful sunsets over Apalachicola Bay are amenities that just add to the relaxing sense of peace and quiet at Sapelo. Great house, great location, wonderful owners, we love our time at Sapelo. It's always a pleasure to have you, your friends, and family stay at Sapelo! We are looking forward to your return next January! Thank you again for your wonderful review. The property was as advertised, located on the water, clean and spacious. Our group very much enjoyed our stay at Sapelo and recommend the property for those considering a great home on St. George Island. This was our 2nd year staying at Sapelo. We have a toddler up through teenagers and my father comes with us as well - there is plenty of room for everyone! We LOVE being bay front and fishing every morning and evening. The variety of sea life is so fun for everyone and the view of the stars at night is simply breathtaking. Everything is clean and we have everything here that we can think of to cook for a big family. Love it! Amazing place for a family vacation! Sapelo was the perfect location for our family. The home was beautiful and had everything you could need in the kitchen for cooking meals for a big group. The kids loved the kayaks and sandy beach right outside the back door. There were hermit crabs, sting ray, dolphins and shark seen just from the dock! The mosquitos were pretty rough, but the owner made sure we were well aware of the issue before we arrived and we had plenty bug spray. We have stayed at several different beach/bay homes in different locations and this was one of the top stays. Loved the setting of the property! Beautiful sunsets and nice private beach on bay. The house is as advertised. It was a beautiful house and plenty of room for the 6 of us. It was very nice to have a private beach on the bay, however, the bay is not really somewhere you want to swim given the grass bottom. It's hard to see the lower half of your leg when you walk in and we were afraid we'd step on something. But we did kayak the area and it was a great place for that and for fishing from pier. If we go back to St. George, this place would definitely be considered but we may go with the ocean side just because it affords a bit more opportunity to get in the water. All in all, a very nice house, great location and a great time! All rentals are on a weekly basis from Saturday to Saturday. Monthly rental is available for January or February. January or February 2020 rate is $3200 per month (28 days). ABSOLUTELY NO PETS ALLOWED PLEASE NOTE: Check-in time is 4:00 pm. Check-out time is 10:00 am (not 11:00 am as VRBO indicates). The Plantation Amenities Fee of $85 is included in your rental. Two single kayaks and a paddle boat available for rental during your stay for $100 each.